My favorite item is the California Tan SPF 4 Outdoor Dark Tanning Lotion – 4.5 oz. My favorite is Designer Skin LUMINARY 25X Black Label Private Reserve Solar Silicone L.E.D Lotion – 13.5 oz. I hope Designer Skin products come up in the giveaways soon. I love the Ocean Tanning Essentials Booster Drops for Airbrush Solutions – .5 oz. I love the California Tan Tinted Self Tanner! My favorite is the Designer Skin HUSTLE Ultimate Dark Tanning Lotion – 8.5 oz.! I fanned Tan For Less on Facebook! I like to use VersaSpa AMPLIFIER PREP GEL. I mix it with my Luminary so it makes my lotion last longer. 9/9 I love the California Tan Tinted Self Tanner! My favorite would be the Paasche D500 Airbrush Tanning System! subscribe to your blog feed! I’d really like to try Designer Skin TINTED LOVE Sun-kissed Daily Moisturizer with a Touch of Sunless Tanner. Hope it becomes available to order soon! 9/10 I love the California Tan Tinted Self Tanner! I love love love the Fake Bake Dark Self-Tanning Mousse – 4 oz. ! I would love to win this give-a-way to keep my tan for this cold winter coming in! I am a fan on Facebook too! I love Fake Bake On the Glow spray! its awesome and shimmery and perfect for going out, and looking hot.! The next lotion I’m going to try is California Tan Cypher Dark Quatro+ Bronzer. Sounds like an awesome product. i would love to try fake bake products…they look of great quality..
My favorite product is the Supre SECRET CRUSH Dark Tan Maximizer. My favorite lotion is Luminary by Designer Skin. I think that after you use the Fake Bake Tan,the Fake Bake SKIN SMOOTHIE Dry-Oil Spray would be great! I would love to win, and the next product I would try would be the Body Drench Moisturizing body wash! Thanks! My favorite product is the sunless tanning gel and spray. I live on the beach in Panama City Beach FL but have not been in a bathing suit in 2 years due to looking for work and working. The economy has been so bad and I am self supporting that that is all I have time to do. I’d love to try their Younger Image Skin Repairing Treatment Lotion. Thanks! I would LOVE to try the Body Drench QUICK TAN Sunless Tanning Mist! I couldn’t find you on Facebook (not sure if the links work, or I’m just FB-dumb?! ), but I did share this giveaway on my FB page! I love Australian Gold Accelerator. Helps you tan really fast. I would like to try California Tan Cypher Dark Quatro+ Bronzer. Hope it will go on sale soon! I like VersaSpa Exfoliator. It smells really nice and isn’t harsh on your skin. I love Australian Gold Accelerator.–for when you really want to look like a cast mate on the Jersey Shore! I love the idea of the Sperti DEL SOL Facial Sunlamp Tanner! I recently moved to New York from Arizona and I just don’t get as much sun as I am used to. I would love to try it! Thanks! 9/13 I love the California Tan Tinted Self Tanner! I would love to try the Fake Bake Sunless Airbrush Tanning Solution! 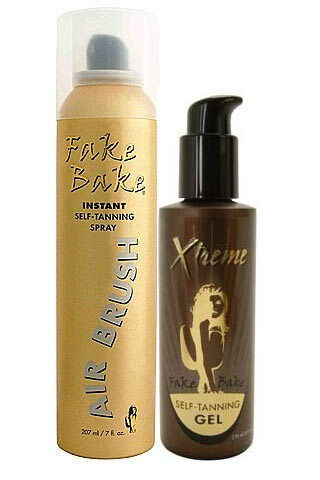 I’d like to try the Fake Bake Sunless Airbrush Tanning Solution – 32 oz. I like the California Tan TOTAL SUBMERSION Body Wash Tan Extender – 12 oz. Hello, I would like to try the SUN Labs Tan Overnight Instant Self Tanning Lotion. I don’t know if it would be a favorite, but since I have never tried any of these, this one sounds as good as any. Thanks for a great giveaway! I subscribed to TanForless blog feed in my Microsoft feeds. Thanks! I would love to try the Fake Bake air brush tanning spray or SUN Labs Foaming Ultra Dark Instant Self-Tanning Spray. I really liked the Designer Skin LUMINARY 25X Black Label Private Reserve Solar Silicone L.E.D Lotion – 13.5 oz. I like he SUN Labs Ultra Dark Instant Self Tanning Lotion. SUN Labs Ultra Dark Instant Self Tanning Lotion rocks! I want to try the Devoted Creations SAVIOR Fine Line Reducing Daily Moisturizer – 17.5 oz.